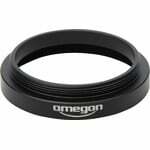 Home > Eyepieces > Omegon > Redline > Omegon Eyepiece Redline SW 32mm Okular 2"
Perhaps you have experienced observing when objects just don't seem to be really sharp. This is often due to using the wrong eyepiece, as these important accessories often decide whether you suffer with or enjoy your observing. 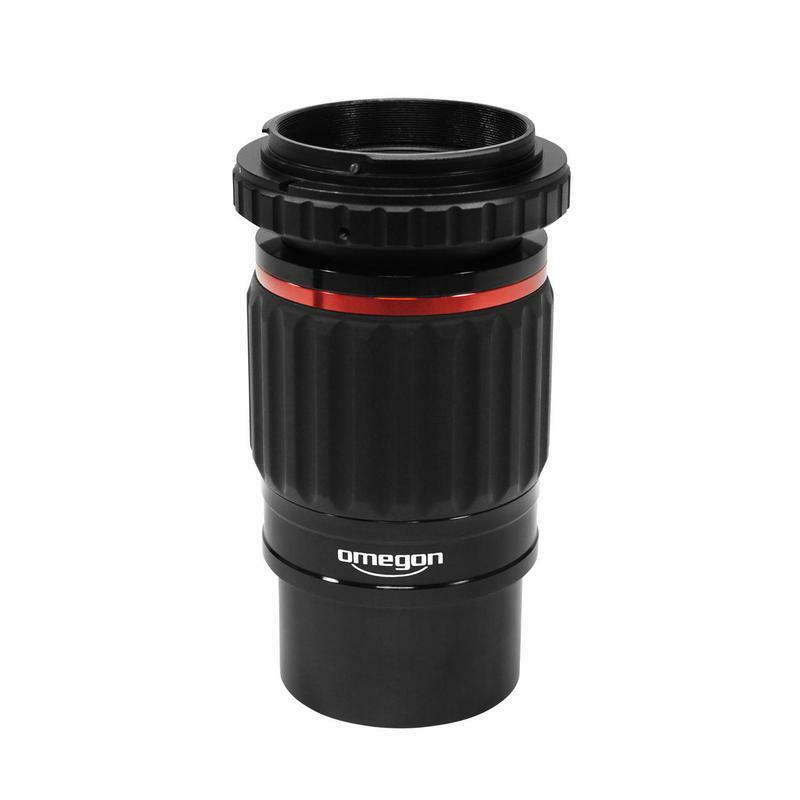 Redline Omegon eyepieces provide a high contrast image at all times - the built-in ED element making this possible. The 70° wide angle optics mean you always enjoy a huge field of view. The first time you observe an object through one of these eyepieces, you will almost certainly be struck by the brilliance, clarity, and depth of colour in the image. What you are seeing is the excellent contrast and sharpness produced by this eyepiece - you can make out fine detail, different shades of colour and fine swirls in the cloud bands on Jupiter for example. 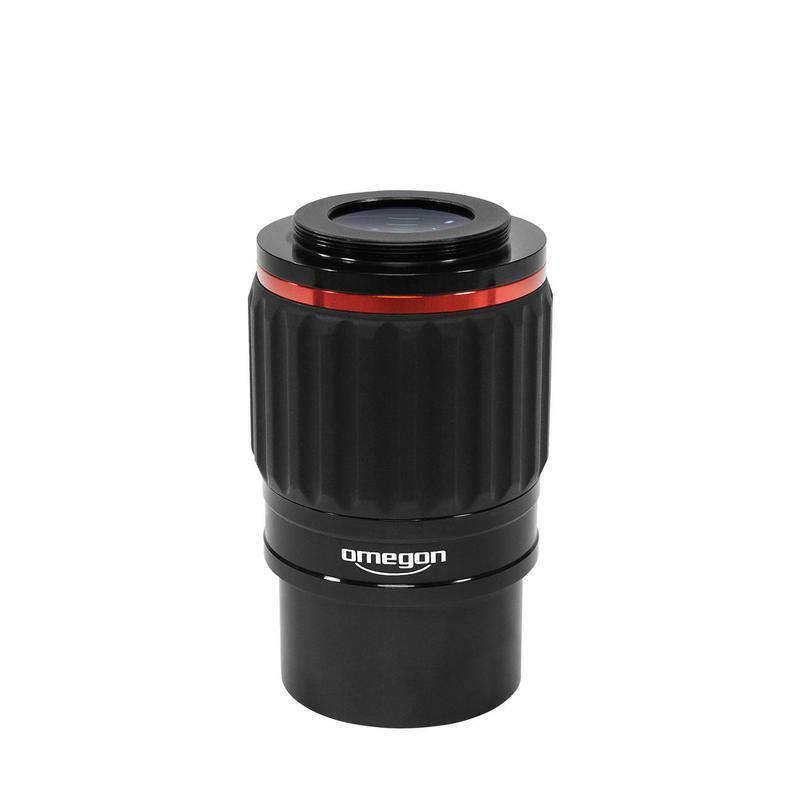 The Omegon Redline gives a 70° field of view, which lets you see a huge swathe of the night sky. No more looking down a thin tube - as was the case with some earlier types of eyepieces. You can observe extended objects in their entirety. A 70° field of view is a physiologically perfect match for the human eye, as your eye can then observe in a relaxed way, without having to strain. The very generous 20mm of eye relief means your observing is always completely comfortable for all the focal lengths available in this eyepiece series. Spectacle wearers can leave their glasses on, as the entire field of view remains visible even then. And if your spectacles correct for astigmatism, it is a definite advantage to be able to leave them on, as you can see a sharper image. A thread under the rubber eyecup provides an opportunity for doing astrophotography. 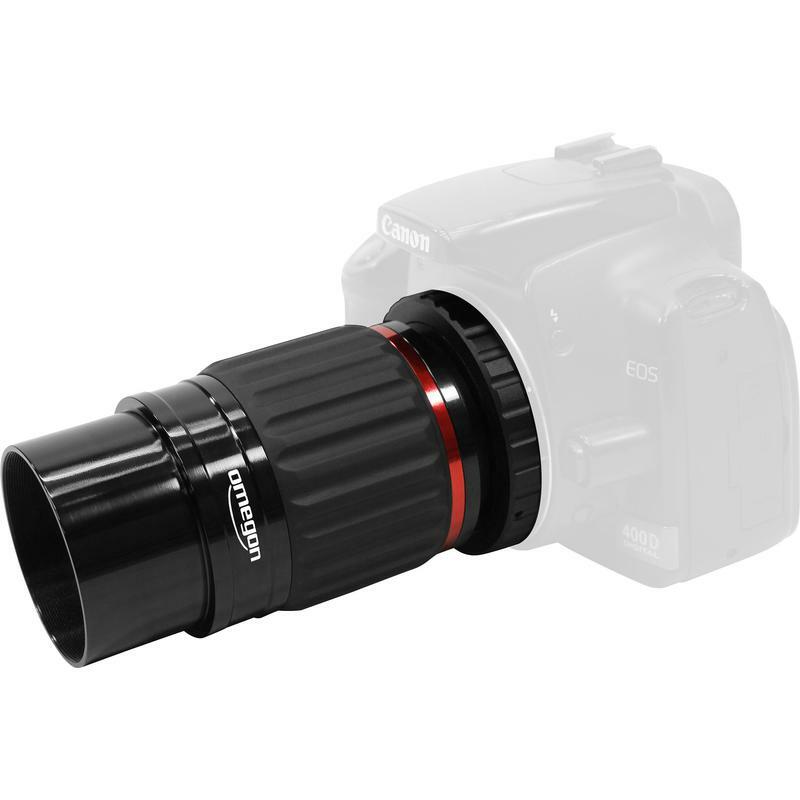 A suitable M43 to T-2 adapter will let you connect your SLR or compact camera and then you're all set for your astrophotography. 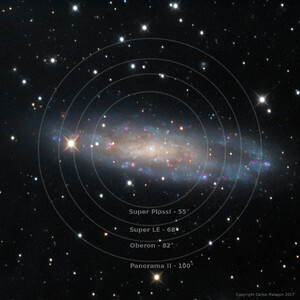 An interesting possibility is, for example, not only imaging planets but also planetary nebulae. 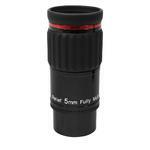 No other eyepiece series offers this. 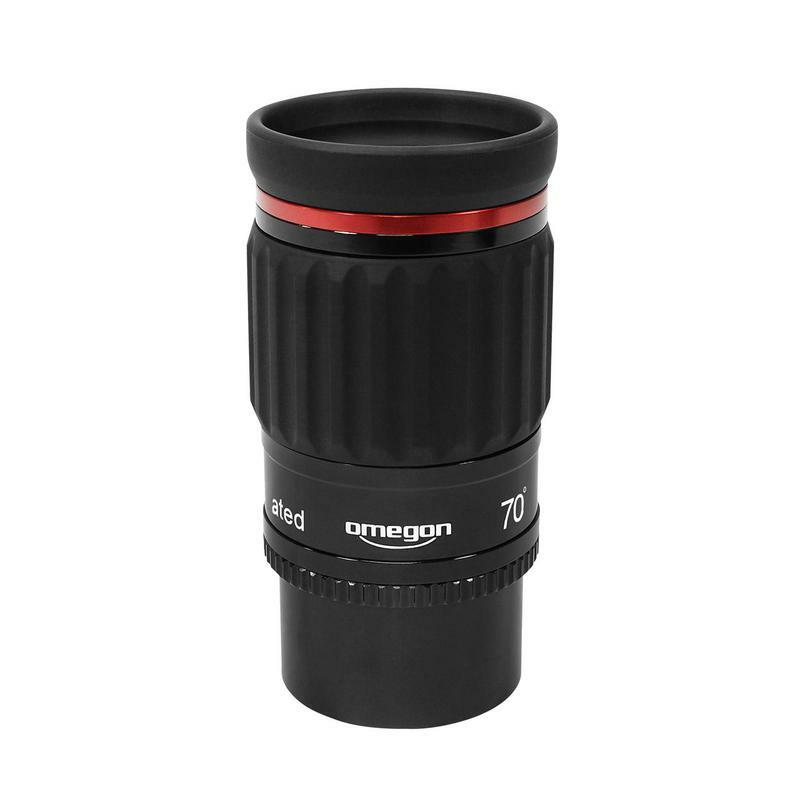 The Omegon Redline eyepieces - from 17mm to 3.5mm in focal length - have both 1.25" and 2" barrels. A 2" barrel sits directly above the 1.25" barrel. This saves having to fiddle about with extra adapters - just use your 2" focuser for all the different focal lengths. 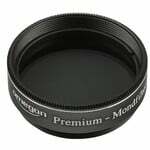 The Omegon Redline series includes 6 different focal lengths - 32mm, 22mm, 17mm, 13mm, 8mm, 5mm and 3.5mm. 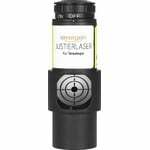 This covers an incredibly range of magnifications with just a single eyepiece series - all of which provide an excellent image. 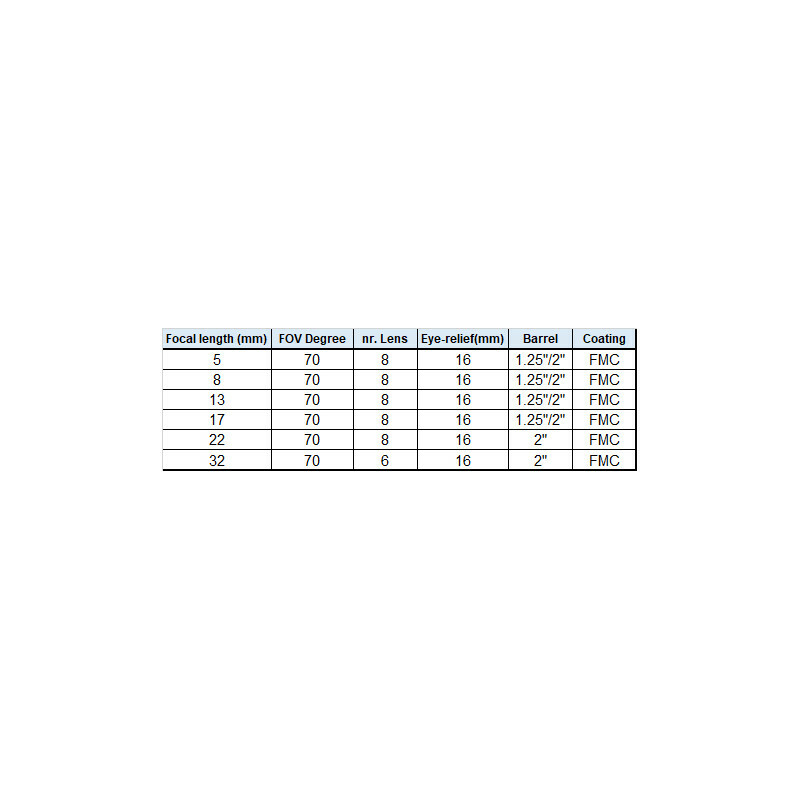 The 6 eyepieces in the series are practically parfocal, meaning there is no need to re-focus when changing eyepieces. 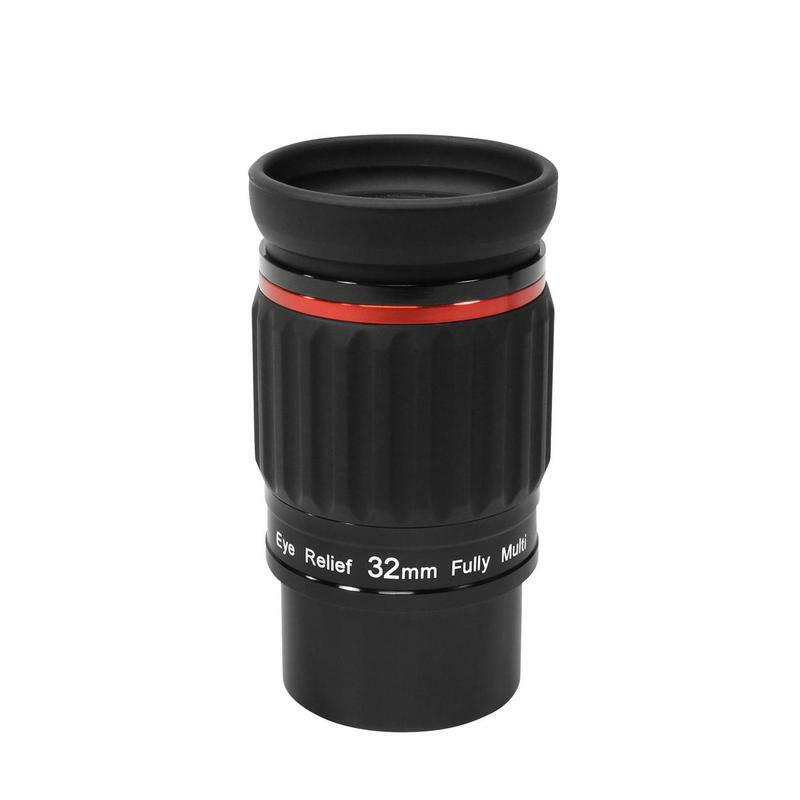 In contrast to the shorter focal lengths, the 22mm and 32mm focal length eyepieces give you the full 2". 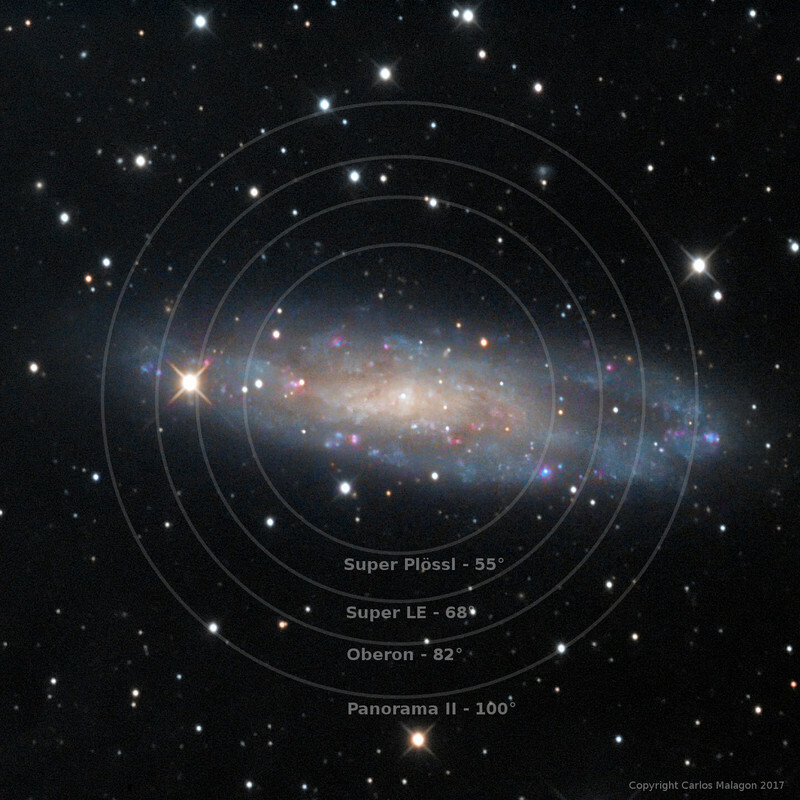 As a result, these models are ideally suited for the deep sky observing of extended objects - but also for faint objects under a dark sky, these two models are the right 'experts'. If, for example, you are far from city lights and observing a galaxy using a 20cm or larger telescope, this 32mm eyepiece will provide you a beautiful view of the spiral arms. The Omegon Redline series includes 6 different focal lengths: 3.5mm, 5mm, 8mm, 13mm, 17mm, 22mm and 32mm, in order to cover an enormous range of magnifications with a single series of eyepieces. 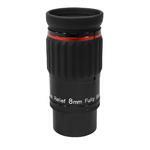 Another advantage is that all eyepieces will provide you with excellent image quality. 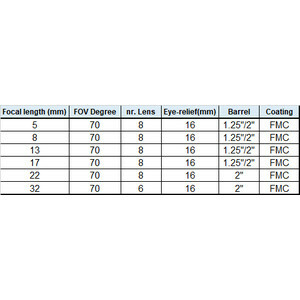 6 eyepieces from one series also means very little re-focusing when switching eyepieces.